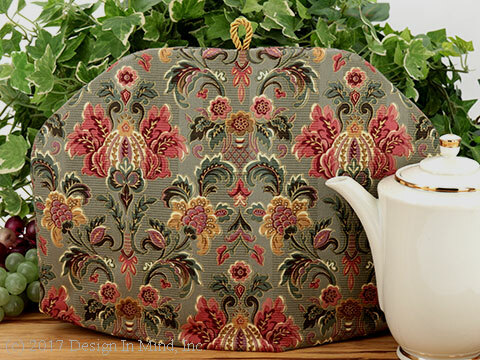 Elegance tea cozies features a range of luxurious fabrics including damask, tapestry, satin, moire and more. 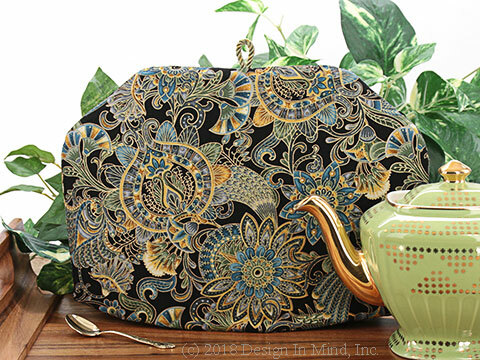 Elegance tea cozies features a range of luxurious fabrics including damask, tapestry, satin, moire and more, some with tassels or other embellishments . 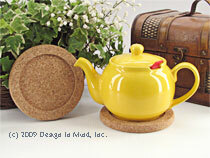 These cozies are made to order and will be shipped typically within 1 week after your order is received. See the "Quick Ship!" 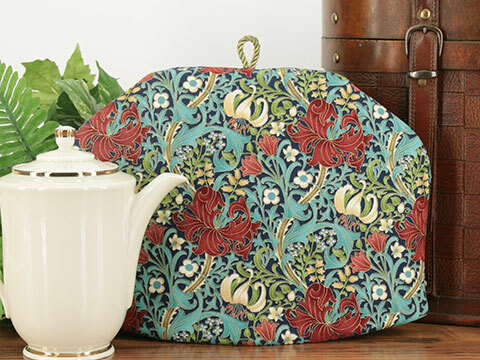 group for tea cosies available to ship now. 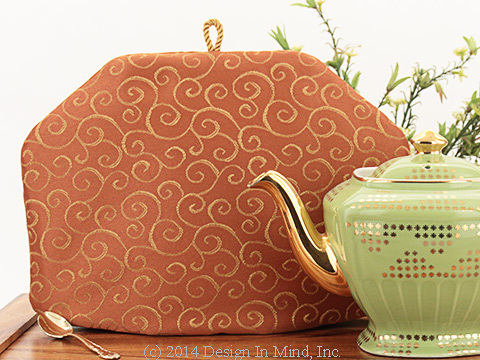 Shimmering vines on a silky background give this tea cozy a simple elegance. 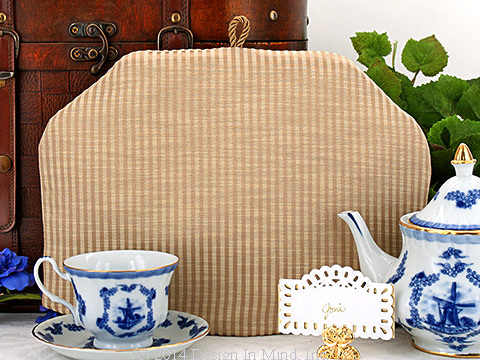 Gold and soft terra cotta colored jacquard decorator fabric. 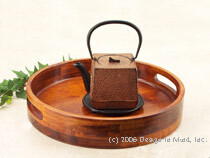 Shown with vintage teapot from a private collection. 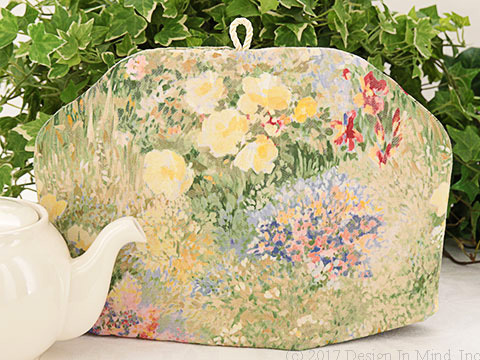 Add a nature-inspired touch to your elegant table. 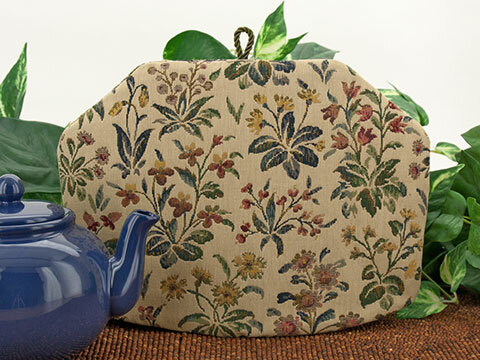 This tea cozy features a natural tan tapestry fabric covered with flowering plants in jewel tones. 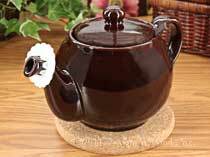 Shown with our Brown Betty teapot in Royal Blue. Beautiful garden moire' upholstery with shimmery highlights. Looks like a fine impressionist painting. 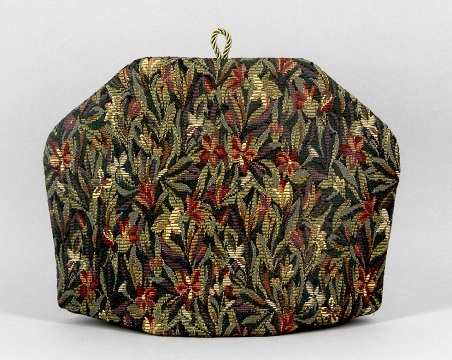 This tea cozy cover is made from a beautiful iris floral tapestry in muted shades of green, gold, and rust. 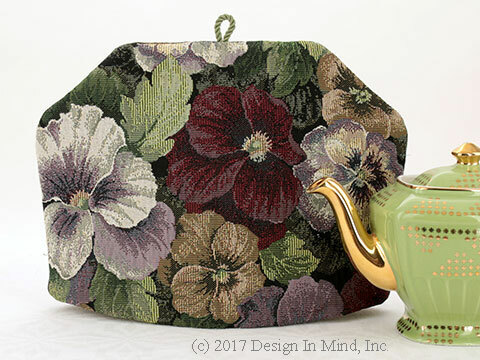 This tea cozy was an early website favorite, and since discontinued.. but we just found enough fabric to make a few more personal size cozies. NOT AVAILABLE IN ANY OTHER SIZE..yes, we are disappointed too! 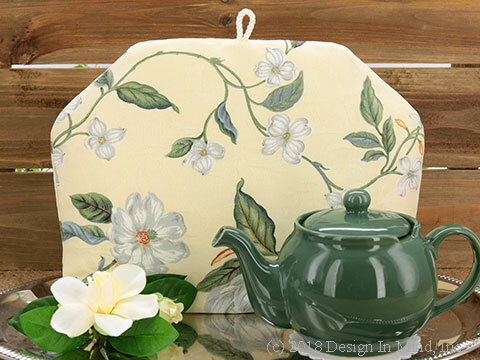 A white magnolia vine printed on buttercream damask decorator fabric. 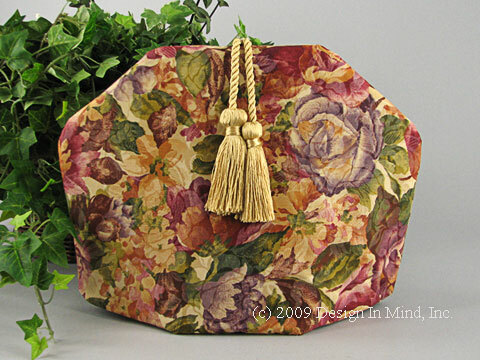 Rich Pansy tapestry in green, cream, purple, and tan. Very elegant! Decorator cotton in muted sage greens with cranberry, rose, and gold. 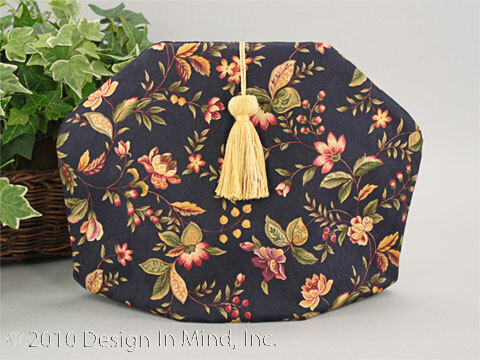 This tea cozy features a floral design in shades of burgundy, plum, orange, green and yellow with metallic gold high lights on a navy damask fabric. Very rich and lovely. Finished off with a gold tassel. Deep brick red chenille with a very subtle diamond pattern. 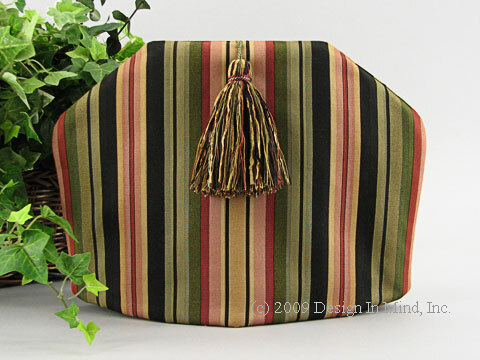 Accented with a multicolored tassel. Very rich. 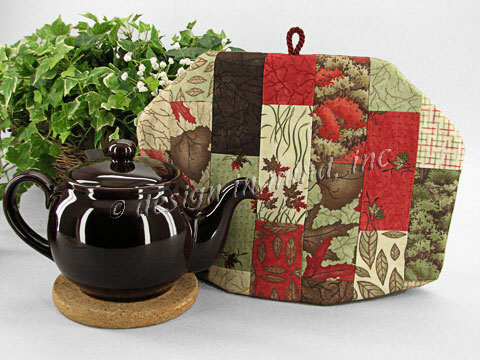 This beautiful tea cozy is a floral design in deep muted shades of burgundy, gold, green and plum. Floral design overprints a tan and cream floral background. Finished with a gold double tassel. Elegant decorator smooth cotton in todays contemporary striped pallet. 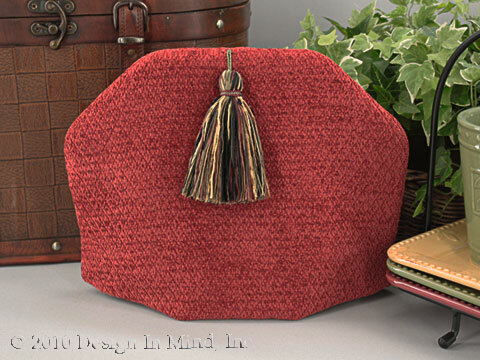 Muted sage, terra cotta, and black fabric capped off with a wrapped bead and tassel.